No folks, it wasn't that annual Calgary Stampede that brought New Yorkers to the Great North, it was a good 'ole fashioned hockey game; one that the New York Rangers lost. Though, the score would suggest that it was a close game - one would think - the Rangers were outplayed for most of the game and Henrik Lundqvist performed poorly when it really mattered. Spectacular saves in the first period led to the Blueshirts 1-0, but the final goal against the Rangers was below average for that guy in net that call "The King". Not sure where he has been lately. Official recap here. Despite what is stated on the NYR site, it was not a close game. 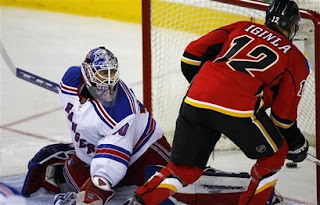 The West Coast Flames were quicker and controlled most of the game throughout. Jagr and Shanahan were invisible, with Scott Gomez a bona-fide 'fast skating loner'. Tomorrow's bout against the Canucks in Vancouver will prove to be the toughest of the Canadian swing this week. Tune in. Short & sweet -- The Dark Ranger has been in deep work mode, so sorry for the brief synopsis (and sorry for skipping the Montreal game) . For more thorough recommendations over the next month, I would highly recommend Scotty Hockey, The Ranger Pundit or The Blueshirt Bulletin. Great work from three of the best Ranger sites out there. Let's go Rangers -- show 'em a little East Coast Attitude. So you are feeling a little guilty after my email in missing the Montreal game Darky??? truth be told it was killer to knock out that game because Montreal outplayed us throughout or until the last period. Remember the second period, the Rangers shot once...let's repeat that....once. so this win streak, after last night's loss to Calgary, make the three in a row feel more fluke than streak. tonight will be tough to beat. Not having faith in our Henrik these days and he has been outplayed by our coach Renney. Valley-boy in waiting is perfectly capable to play more games, which would give-back Henrik his edge. Tonight, I suspect, will not be THAT game I anticipated earlier in the season. But time will show....R.A.U. The Dark Ranger feels guilt for NO ONE!